Today, I’m driving (or riding in) a van full of fellow graduate students to St. Charles, Illinois, an easy 2.25 hour drive from Madison. Contrast that with the flight to Washington D.C. last year. That’s right, I’m going to the 51st Maize Genetics conference! I’ve got some recording equipment with me and a good digital camera, but I have no plans to do a podcast of the conference like I did last year. I have a couple ideas up my sleeve to be revealed at a later date. I’m looking forward to finally meeting Anastasia at the meeting, too. Check Biofortified for updates. Hawai’i is a remote archipelago of islands with a declining sugar industry. The new expanses of open acreage are now being filled with GE crop trials, and controversy. The University of Hawai’i produced the first GE Papaya resistant to Papaya Ringspot Virus, which grows there today (and even surrounds and protects organic plots of Papaya), and is currently investigating several other crops and their potential for improvement. Those efforts have been put in jeopardy recently as the council of the big island of Hawai’i banned the growing of GE taro and coffee with no allowance for continued academic research. So if this was about helping Hawai’ian farmers defend themselves against Monsanto and worried coffee consumers, why was there no provision to allow University GE research on the big island of Hawai’i? This weekend, I participated in my first Pumpkin Regatta! 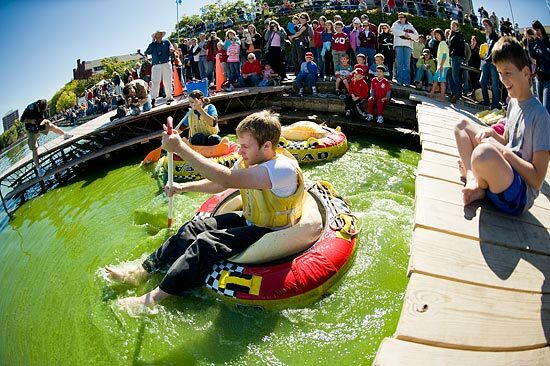 Organized by Jim Nienhuis and Irwin Goldman of the UW-Madison Horticulture department, it pits students, kids, and sailors alike against each other in a rowing race of giant proportions. Specifically, giant pumpkins. Which you sit inside. And paddle. The 21st century is hailed as the century of biological sciences, particularly biotechnology which is revolutionizing all aspects of our lifestyles from food to agriculture, environment, industry, and healthcare and medicine. Biotechnology is changing the terrains and landscapes of these fields to enhance the quality of life and environment. Countries are racing to embrace this powerful tool to create wealth though innovation. Malaysia is not spared as the government has pledged it strong commitments to develop this sector. Continue reading It’s spreading! Posted on July 25, 2008 Categories Agriculture, Education, Food, Genetics2 Comments on It’s spreading! Previously, I engaged in a discussion with someone who helped put on an anti-evolution event in Florida. He came on displaying classic trollish behavior, and as soon as I pointed him out on that, he laid out some of his arguments. Following that, I responded to the arguments in kind. The discussion trailed off, and at least one thing was resolved. A couple people chimed into what was primarily a debate between John and myself.